Who don't like flowers? Receiving flowers would put a smile on one's face thus brighten up her days. I love flowers very much that I attempted to becoming a florist at one point. I attended basic flower arrangement classes many years back and run a home base florist for a short while. To promote my business, I designed my own leaflet with a catchy phrase "Roses say a thousand words" as roses are commonly used to express the feelings and emotions in us. The colours of the roses represent different meanings. Before you order a bouquet of roses to be delivered to someone, it would be wise to check on the meaning of the various colours of roses or consult your florists, they would able to recommend the ones that best suit your feelings. 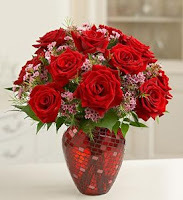 Based on my experience the most desired colour is Red rose as it signifies love and passion. Pink roses signifies appreciation and gratitude; yellow roses used to represent jealousy but now signify friendship, joy, congratulations. Sending lavender roses to convey a message of "love at first sight" to someone special whereas white roses signifies purity and spiritual love. Besides having to know the meaning of the respective colour of roses, the number of rose that you send is also significant. One stalk of rose represents love at first sight and you are the only one; most of us know what's the meaning of three stalks roses mean, that is I Love You; twelve stalks of roses mean Be My Steady. You could easily convey your message to someone special by placing orders on line, there are a number of on line florists would be able to deliver your flowers within a day. Our deepest sympathy goes to Hazel & her family for the lost of their beloved husband, father and son, who was suffered from severe pneumonia and H1N1 positive, he passed away on Monday, 27th July 2009 leaving my friend, Hazel and two kids. He is the third death caused by the virus as reported in the news. Hazel was my house mate in Oxford, England back in 1994, we shared the same house when she was pursuing her degree in the Oxford Brookes University. The news saddened me. The sadness in her for the lost of her beloved husband is even harder for her to bear. Please help me to include her in your prayers. It's me flying the kite! 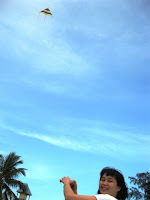 It was taken a month ago at the Tanjung Aru Beach. We bought the kite after much nagging by our girls to ask the daddy to make a kite for them. To make the task easier, we bought one from the shop. We brought it to the beach one fine afternoon for the girls to experience the fun of flying the kite. With the guidance of the daddy, they played the kite only for a few minutes, zoom..they went to play the sand, they have obviously lost interest with the kite in just a matter of minutes..."sigh"
Here I was taking turns to fly the kite with Clet. I am sure our girls will ask for a kite again in the future. Yesterday at sister in law house, the display of the eXfuse Seven+ nutritional foods drinks on her dinning table made my head turned when I walked pass her kitchen. Quickly took out my camera to have a few shots of the display. She has also used the empty bottle of the eXfuze Seven+ as flower vase. Exfuze Seven+ bottles not just a superfoods drinks but also a wonderful decorative items. It's nice to have a big garden like what my BIL is having somewhere outskirt. Besides having fresher air, there are a lot of space for flowers and fruit trees. I took the opportunity to snap some photos of the flowers planted by SIL while we were there three weeks ago. Flowers do brighten up our days even without knowing their names. 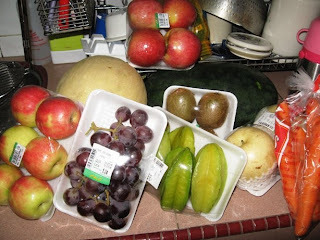 We could stock up more mangoes in our fridge each time after a windy rainy day. 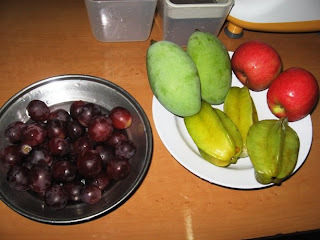 The wind tends to bring down more mangoes to the ground, hence, 20 over mangoes for us in a single day. I make some into juice as requested by Clet using a blender instead of the juicer, giving us a very thick yogurt mangoes juice, with some yogurt. Crytal & Pearl do not like it at all. I made mine a little special by adding more yogurt, a sprinkle of bee pollen granule and some flax seed oil for addition nutrition. On his birthday itself, we had a buffet dinner at Promenade Hotel. Surprisingly, we filled up our stomach fairly quickly with the main course, we hardly touched the dessert counters though the little pieces of cakes were very tempting. Crystal and Pearl love the ice cream with pieces of cheese while I opted for Jellies and ice cream. I had a very bad food poisoning experience on Tuesday night till 3am on wednesday morning. A similar experience that I had during my previous two morning sickness. It was so bad that I was too weak to get out of bed after 3 times forceful vomitting and 2 times diahhrea early in the morning while everyone was soundly asleep. Concidently it was Clet's auction session in the morning that he couldn't bring me to the clinic. I lied on the bed for the whole morning only went to the clinic about 2 pm and waited for the doctor to come in at 3pm, luckily I was the first one in line. Too scare to vomit again I only took some sago soup (believe to be able to stop the diahhrea) and little bit of porridge that Clet bought for me before going to the clinic, it was my favourtie fish porridge but yesterday I felt like vomitting with its smell. Everyone said it was the cause of the detox programme that I took the week before. Well could be partly. I was to be blamed as well cos after the 7 strict diet detox days, I was back to my old self again that used to whacked the nice food in front of me like no tomorrow. It started with a buffet dinner for Clet's birthday on Monday and followed by another dinner treat by SIL on Tuesday that my cleansed colon could not take it anymore. I am back to work today with slight headache and still with vomiting feeling. Have had half bowl of hot meehoon soup in the morning and one apple for lunch. Called my mum to boil soup tonite cos I am still not well to cook dinner for my family. Interested in buying properties below market value? The best way is to buy them at the auction sale. 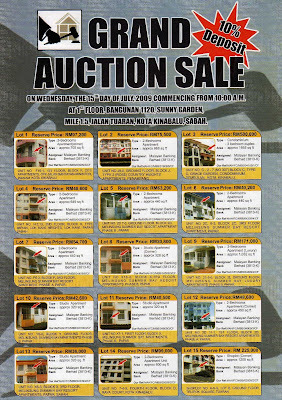 There will b a grand properties auction sale here in Kota Kinabalu, Sabah on 15th July, 2009, that's tomorrow. 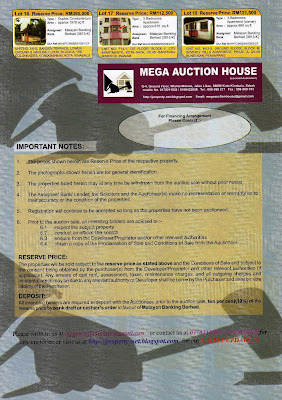 Please refer to the Auctioneer site for more details on the properties for auction. I guess some of you might be wondering what the DRP I am talking about, I should have posted this before I even started with my DRP 6 days ago. But all is not too late, right? After the live blood test, the result got me worried about my overall health. I told myself that by hook or by crook I have to start the DRP programme as soon as I got the free package of the DRP set which was given free to me as staff on an annual basis by the company that I work. Together with my two other colleagues, I started with the programme 6 days ago, mentally ready of course. Besides having the DRP set in place, there are certain vegetable and fruits that I have to get ready before starting the programme. 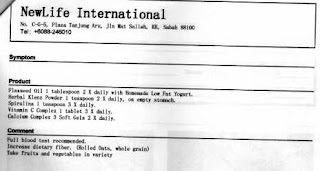 Basically the whole programme put us on a very strict diet, only fruits, vegetable and supplements are allowed. These are some of the fruits and vegetable recommended in the programme. The carrot and apple are for juices. Celery, onions and potatoes together with tomatoes, leeks, garlic to be cooked into Hippocrates' soup as meals throughout the 7 days. I got bored of the soup on the 3rd day that I replaced my meals with mashed potatoes, boiled potatoes and fruits instead. I have been coping well with the strict diet with no much temptations to break the fast, it would be a challenge if I am a meat eater, glad that I am not. I was a bit worried on carrying out the coffee enema at the beginning, luckily I managed it quite well from the 3rd day onwards where I found a comfortable place to do it, that is, the bedroom, even with Pearl coming around again and again to check on me, and asked "mummy, you do the "emema" again?". There is still one more day to go to complete the programme. I have been asked what I feel like having for my first meal right after this programme, my answer was, Laksa flavour Maggi Mee, hahaha...just kidding. I would go for porridge so that my stomach will not be shocked after 7 days without solid food. I am into Day 5 of the 7 days Detoxification and Rejuvenation Programme (DRP), I am amazed how this programme works, I already felt the cleansing taking effect on the 4th day, I guess the cleansing effect could have been faster if I were to do 2 coffee enemas a day as recommended. I have been on 1 coffee enema a day due to time constraint. This programme is easier to follow than I first thought especially on the coffee enema part which I did not feel at ease with initially. I finally got myself comfortable doing it in the bedroom than in the bathroom before taking my shower and dinner. I did the coffee enemas in the bathroom for the first 3 days in the morning which I find very uncomfortable lying on the bathroom floor for one thing and also the need for the morning rush has deterred me from carrying out a proper coffee enema which usually takes up to 15 minutes at least. I am a bit tired today could be because I have had very little solid today than the previous 4 days. Got bored with the hippocrates' soup since the 3rd day and the urge of eating solid is not there anymore, moreover, my stomach is filled with cleansing drink, tissue building drink, health drink and juices most of the time. There will be 2 more days to go to complete the whole programme and I am happy with my progress so far. I will post more about it in my coming posts. I had a live blood test 3 weeks ago. The result....can be better. If I hadn't been taking any supplement all these while it could be even worst. Live Blood testing is some what different from the normal lab blood test. It tests the quality rather than quantity of our blood. 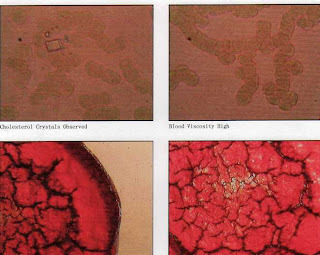 This test report of my showed that cholesterol crystal are found, my blood viscosity is high (the obvious symptom is the numbness or tingling of feet or hands), calcium Deficiency Observed and mild Free Radical Damage was also observed. Eventhough there is nothing serious to worry about but it is also advisable to better my health position before situation get worst due to poor diet, lack of sleep, stress, and other factors. A few supplements were recommended to me together with the report. Newlife office in Tanjung Aru Plaza is offering Live Blood Test on every Wednesday, RM55.00 for members and RM75.00 for Non Members. It is the only place that offers Live Blood Test in KK so far. For betterment of my health, I am taking the 7 days DRP (Detoxification and Rejuvenation Progrmme) at the moment, hopefully it will show a better health result after the DRP. 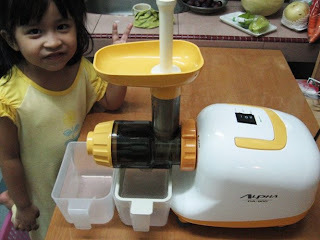 I always wanted to own a unit of Alpha DA-900 juicer & food processor for my kitchen. I finally bought it this month, thanks to the company that I work for offers easy payment scheme for staff. It comes with a VCD which I showed it the night I got the juicer. After watching the VCD, my daughters begging me to buy it, I did not tell them that it is already in the kitchen. 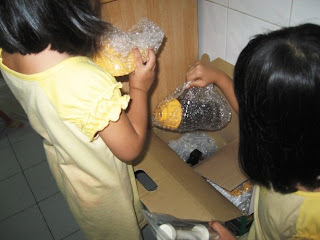 They were thrilled when they saw the machine can actually make noodles, slicing potatos, and make juices, to them it would be a good toy to play. 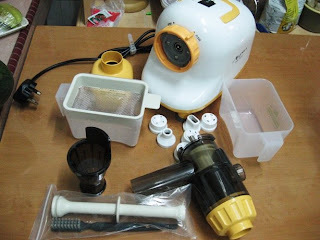 This Korean made juicer is more than an ordinary juicer that I used to have. It is more than 9 machine in 1! It is also the first juice extractor equipped with a "Mill-type Bio Auger" gear, which functions exactly like a stonemill. It preserves the oringinal flavour, nutrients and living enzymes found in fruits and vegetables. It is just what we need for my DRP "Detox & Rejuvenation Programme" that I will be taking tomorrow for 7 days. 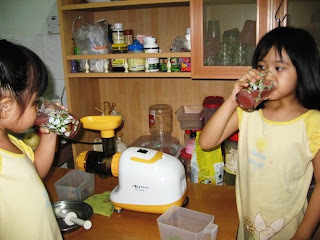 There is no sharp blade in this juicer so I let my daughters took charge of the juicing which they enjoyed very much. They are also eager to try the juices that they extracted, easier to get them to drink juices now. The details on the reserve prices, floor areas and the exact locations can be found at the Property Net website.